The EVGA GTX 275 has a very powerful cooling fan. 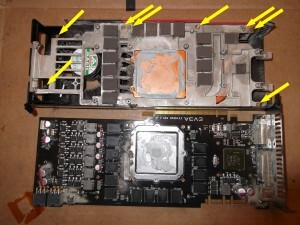 When the GTX 275 is new it does draw in a good amount of cool air into the heatsink to properly cool the GTX 275 video card. As you see in the photos below, over time it brings not only a good amount of air onto the card, but dust, hair, lint to. This dust and pet hair etc will eventually block, limit the cooling capabilities of the card. Running the temperatures much higher on the GTX 275, or any video card. First off, this is a guide and by no means does Lightspeeds Computer Repair take any responsibility in the dis-assembly of your equipment by this guide & photos, and you damaging the equipment. Dis-assemble, re-assemble at your own risk. 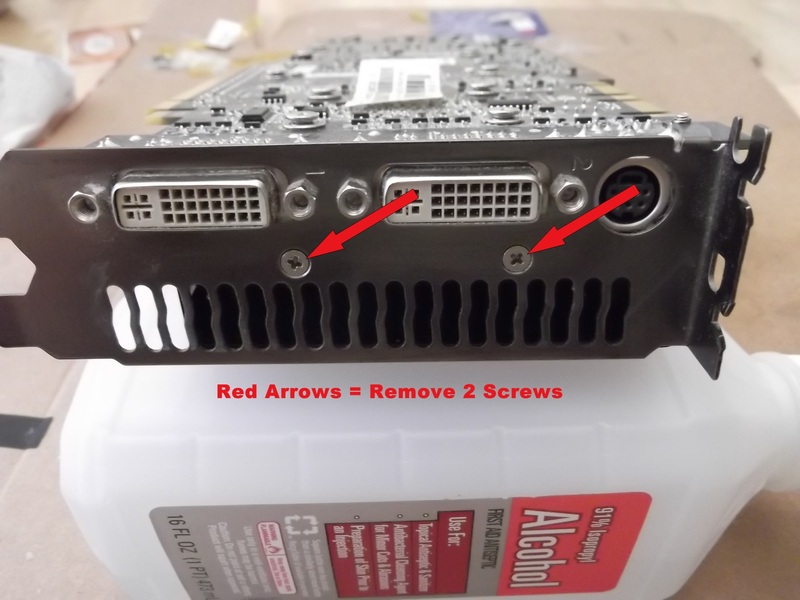 Below photo, carefully removed the 13 larger “red arrow” screws. 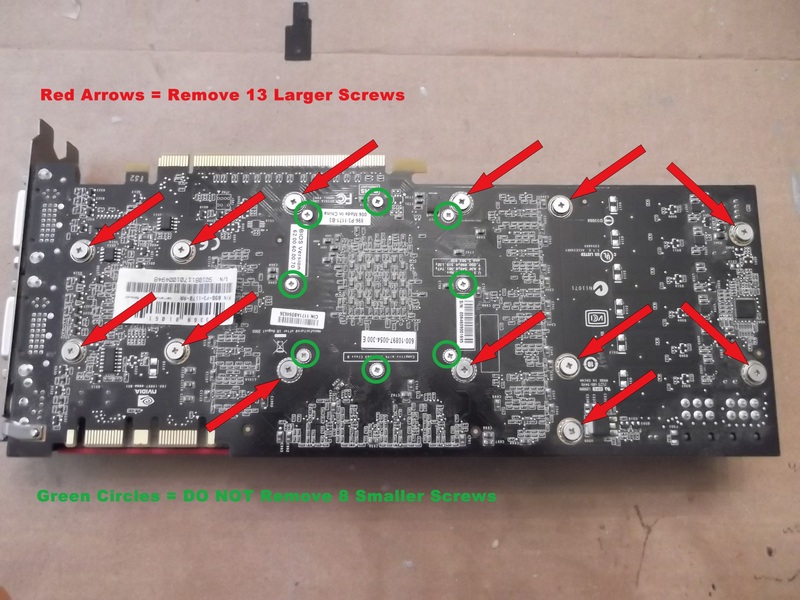 The smaller 8 screws – “green arrow” you DO NOT have to remove. 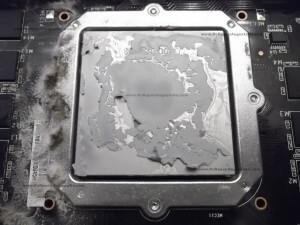 This is the outer ring guard around the Nvidia Graphics chip. 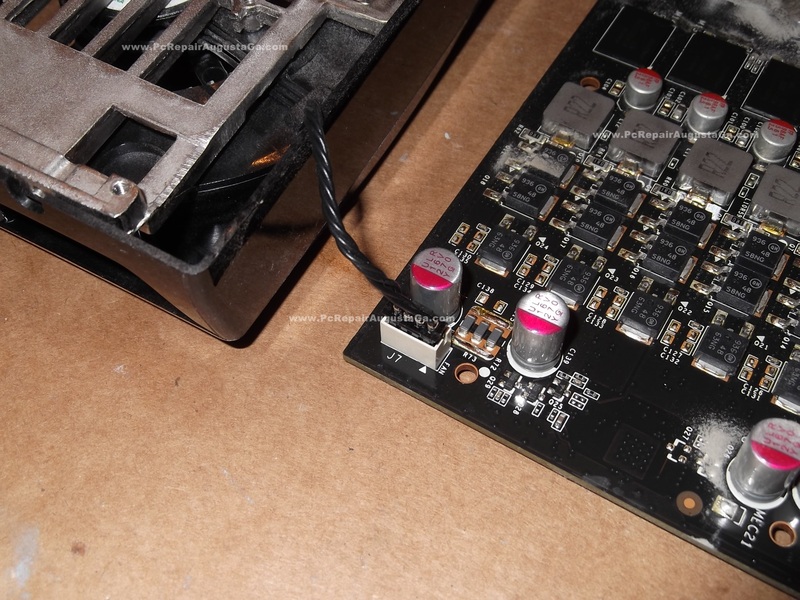 2 more screws to remove on backplate, see below………. 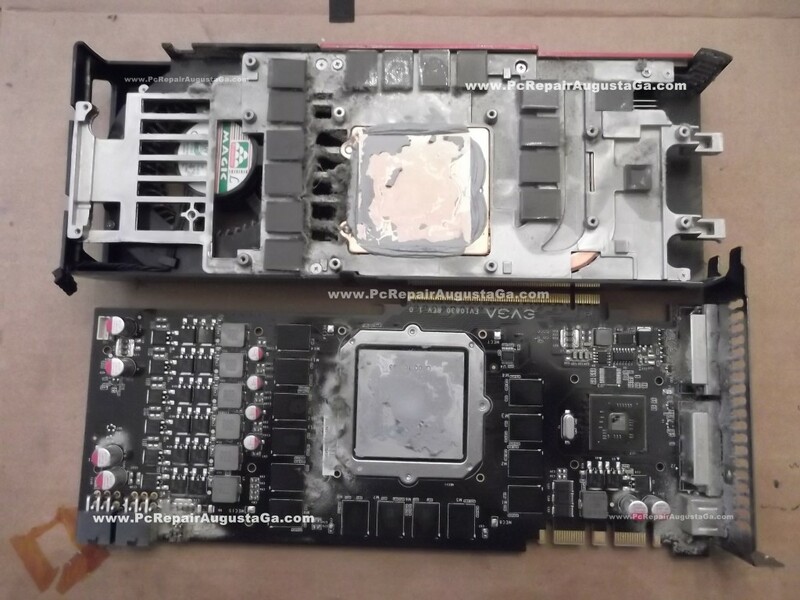 After removing the 13 “Red Arrows” screws, and 2 screws “Red Arrows” on backplate,,, give the PCB board and plastic casing a slight twist left to right, to free the 2 pieces. See next photo. 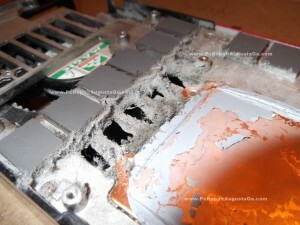 After separating the PCB and outside fan casing, take a look below and notice the dust, dirt. accumulation. Be careful the heatsink has 14 thermal pads that cover the 14 memory chips on the PCB board. Do not lose these, if you knock one of these pads off you can easily put back on. Oh yes, take a look at that dust accumulation. 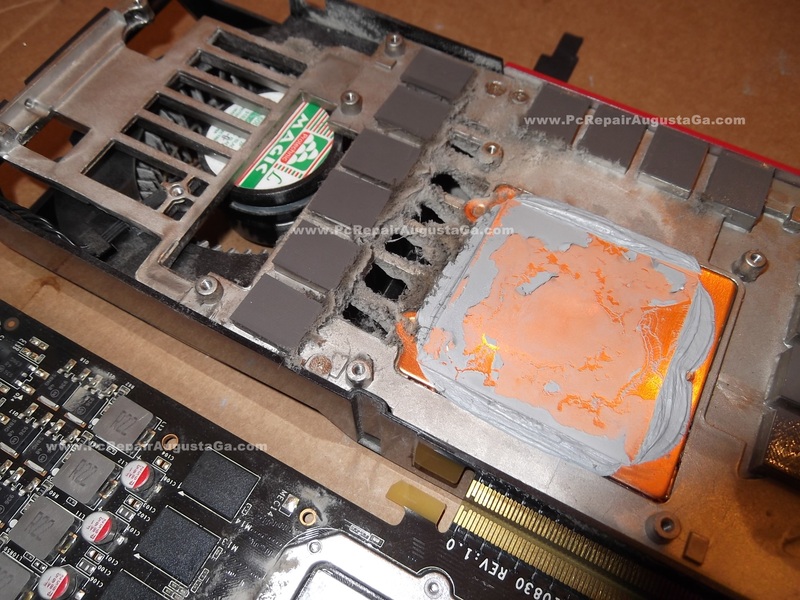 Also note the dried up stock manufactures thermal compound on the heatsink. 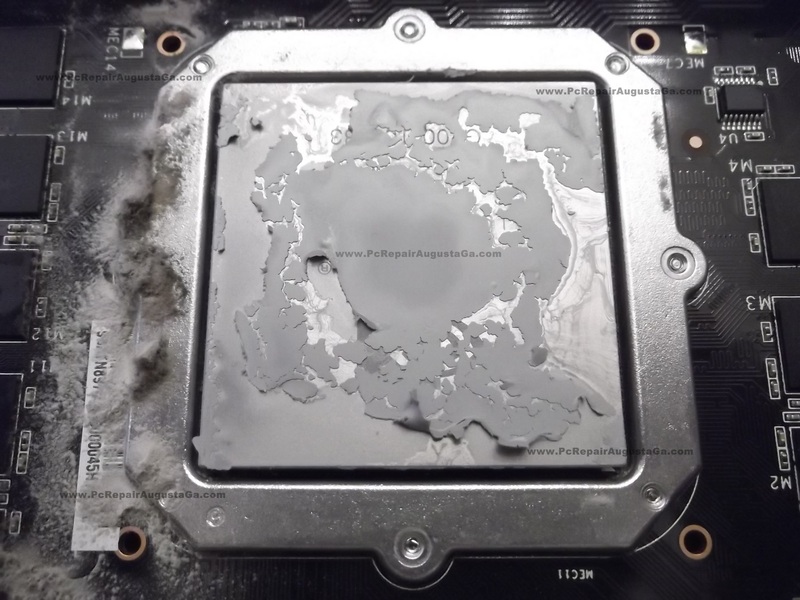 And dried up stock manufactures thermal compound on the Nvidia graphics ship itself. Also notice the dust – dirt to the left of chip. To remove the heatsink fan unit, you have 8 very small screws to remove. 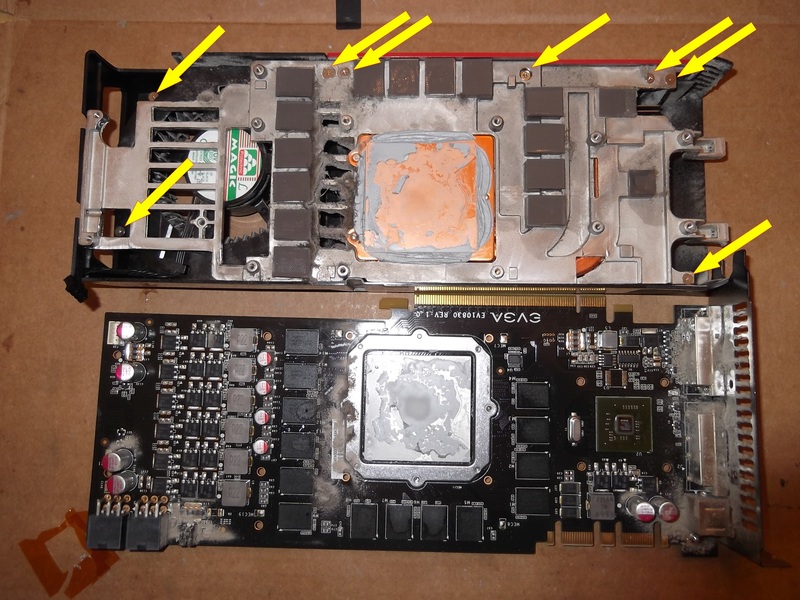 Once these 8 screws (yellow arrows) are removed the heatsink / fan unit will lift right out.